For other uses, see Pennant (disambiguation). A pennant is a commemorative flag typically used to show support for a particular athletic team. Pennants have been historically used in all types of athletic levels: high school, collegiate, professional etc. Traditionally, pennants were made of felt and fashioned in the official colors of a particular team. Often graphics, usually the mascot symbol, as well as the team name were displayed on pennants. The images displayed on pennants were either stitched on with contrasting colored felt or had screen-printing. Today, vintage pennants with rare images or honoring special victories have become prized collectibles for sporting enthusiasts. While pennants are typically associated with athletic teams, pennants have also been made to honor institutions and vacation spots, often acting as souvenirs. New pennants are made of stretched canvas over a wood frame and are used for every youth sport award and recognition. In addition the pennant is a popular branding item. In Major League Baseball, a pennant typically refers to such a flag flown specifically by the National League or American League championship team of a given season, or to such a championship itself. The last few weeks of the regular American professional baseball season are known as a pennant race. This is a holdover from the time (pre-1969) when the league championships were determined by the team with the best record at the end of the regular season. The pennant winners earn the right to play in MLB's title round, the World Series. Since 1969 the pennants are determined by the National and American League Championship Series playoffs, analogous to the NBA and NHL Conference Finals series and the NFL's NFC/AFC Championship Games. 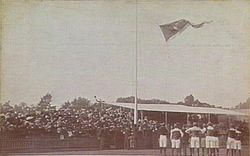 In Australian sports, the term flag is used in the same context. The pennant is waved around in the crowd to show support to the sport team they are cheering for.